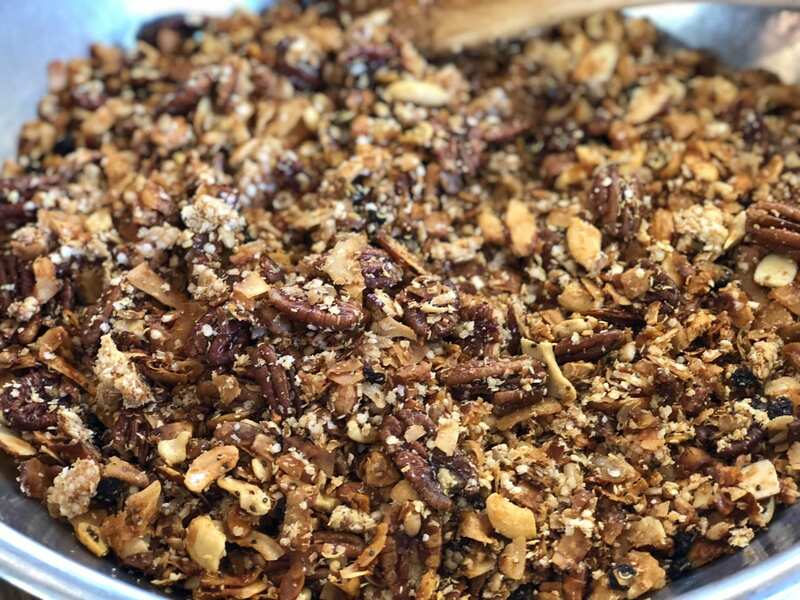 You will not believe the taste of this gluten free, grain free, paleo crock-pot granola! Our recipe takes no time to put together. It is great over your favorite yogurt for breakfast, Paleo protein snack, or as a topping for your coconut ice cream. All you need is five minutes to gather the ingredients, throw everything into the crock-pot and let time do the rest. The gluten free granola turns a golden brown and has your whole house smelling divine!! I was first introduced to crock-pot granola while chefing on a Living Yoga retreat. 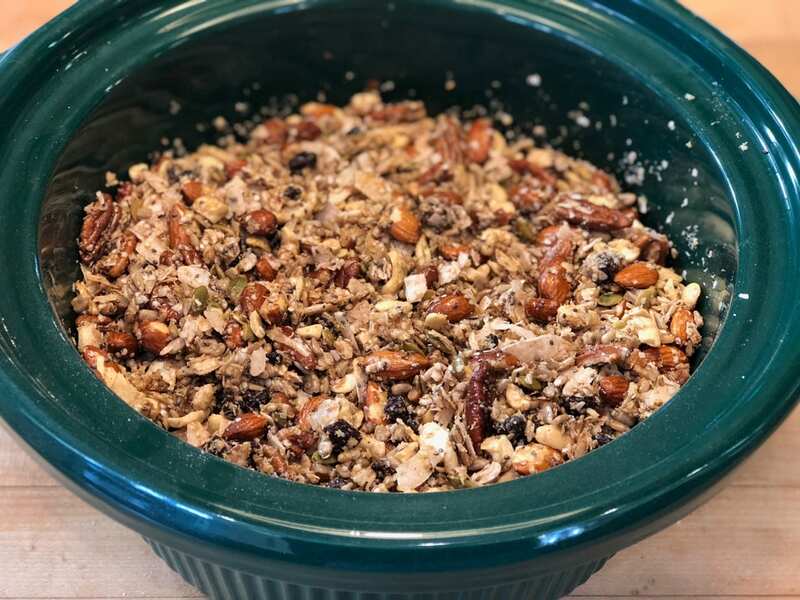 One of the teachers suggested I make her super easy crock-pot granola recipe. After a few Curry Girl tweaks, into the crock-pot it went and on I went with the rest of my day. After three hours, I returned to the kitchen and was loving the smells coming from that pot! The granola was not only easy to make, it tasted like everything you would want in a granola and more! Granola traditionally is made with oats, so we decided to switch it up… This gluten free, grain free, and paleo recipe uses coconut flakes, cashews and pecans for the bulk of the granola. All of these nuts can be swapped out for you favorites though. If you love macadamia and walnuts, use them instead! We went even further and added another beneficial ingredient. QUINOA FLAKES. Inspired by our friend Alyssa aka. Simply Quinoa. 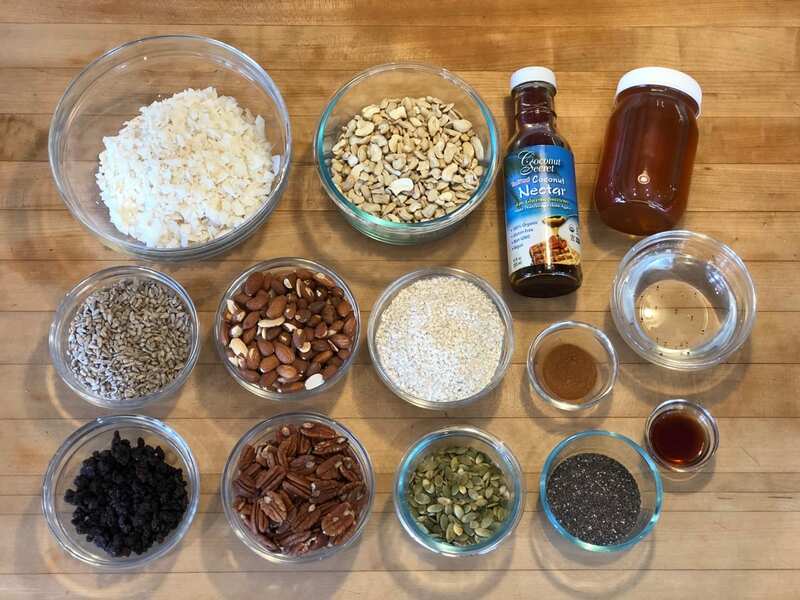 Add a plethora of your favorite nuts and seeds: pecans, walnuts, almonds cashews, hazelnuts, pumpkin seeds sunflower seeds, hemp seeds, and or flax seeds. Mix everything until thoroughly blended and they are glistening from the oil and sweeteners. Cook on low heat in the crockpot for 3-5 hours or until nicely browns and crunchy. Stir occasionally and check every hour.